I inadvertently moved a folder of photos and when I launch PhD I'm prompted to [Find] the new photo path or [Remove] the photo. If there is a way to determine the original path, that would be helpful too. For now, I can move the files back to that location. Still want to know why [Find] isn't working though. I don’t know. On photos that I worked on before and is missing then Find opens a Locate the Missing Photo window that tells you the Original file location and you have to browse to the new location and there is a checkbox for Apply to all missing photos in this new folder. Perhaps that it is different if the photo was not worked on before. That's strange. It's working correctly here, as tomasc reported. I can think of no reason the Find "function" might not be. If you had previously worked on editing the photos in the "Bonaire 2018" folder, this suggestion won't be satisfactory but, as a temporary measure, you could remove the folder from your library then re-import it. Of course, your editing will be lost. I'll attempt to find any possible cause. If there is a way to determine the original path, that would be helpful too. Open Notepad, then use it to open your most recent .phd file (project file). Scroll through the text to find the name of the folder or a particular photo. That will show you the file path. Of course, your editing will be lost. Back to the original issue, I deleted an interim version of a clip I had previously edited and exported from PhD, and now I also have nothing happening when I click on Find, other than seeing the button "respond" by changing color. Seems like we should report this as a bug. The photo thumbnails for the Myemerald folder are all missing. 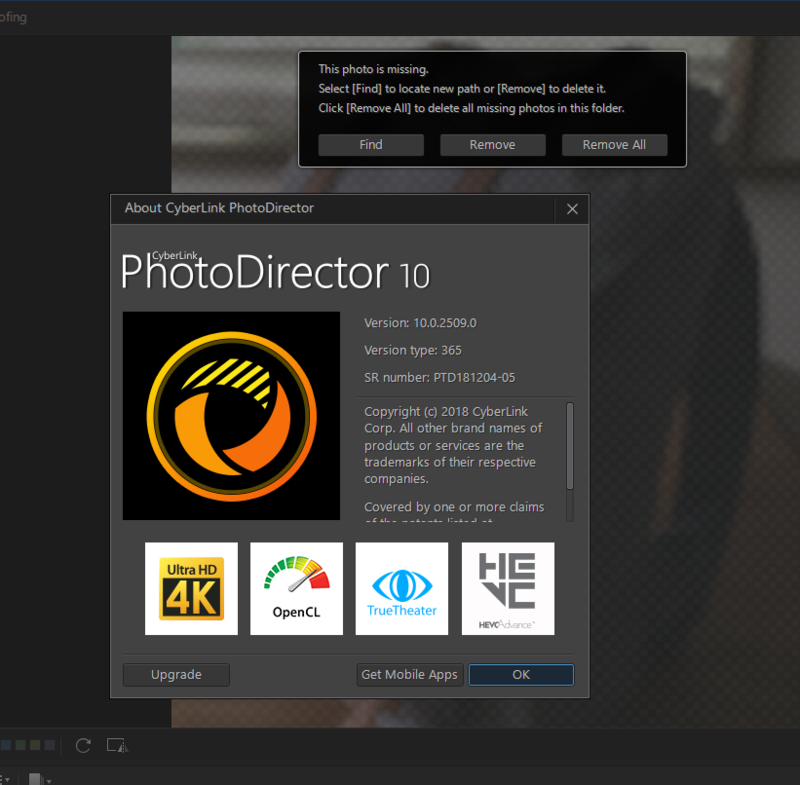 The photo thumbnail for Optodata’s missing photo is shown in his screenshot. The problem does not appear to be the same. I just imported a photo. Closed Phd10. Moved the photo to a different folder. Opened Phd10. Latest imports displays this screen. Click Find and get the Dialog box mentioned earlier. Using the perpetual ultra version and it is the same build as the 365 one. See the screenshot. Is it possible that the bug is in the 365 version. Myemerald may want to report this bug. The Phd10 appear to be okay here. Quote The photo thumbnails for the Myemerald folder are all missing. The photo thumbnail for Optodata’s missing photo is shown in his screenshot. The problem does not appear to be the same. Tomasc, thanks very much for pointing out the difference. I did some more testing and I think I can identify the exact trigger for recreating the problem. I tried your test of importing, closing PhD, moving the pic, reopening PD and the Find box worked normally, just as you described. I knew I had edited my missing clip, so I tried a couple of different edits (both of which created a virtual copy), but when I closed PhD and moved or renamed the source clip, the Find function still worked normally. The Find tool breaks when the path to the original folder that the missing clip was in is either missing or renamed. In other words, Find will work as expected if any clips are moved or renamed, but if the orginal path is gone or changed, Find isn't able to recover. It obviously should jump up to the drive or My Computer level and let you browse from there, but that's not happening. I believe this is the same issue MyEmerald was facing when she moved her entire folder, and I'm happy to report this issue if other people can confirm my hypothesis. Optodata – It is possible that you are right about all this. See the screenshot. The root and subfolder exists. The 3rd level subfolder with 9 photos are deleted months ago. There is a “?” prefix for the missing folder. I believe that if the root and some subfolders exist then it is still okay. In the screenshot here only, the last subfolder of the path is missing. I do not want to remove my root folder to test this theory as my other software have links to them. Maybe Cyberlink support can give an answer that is correct or not correct sometimes. Root and subfolders exist except for the last one in the path. Further test on PHD10 show no problems with a Renamed and then Deleted Root folder on my Drive D. Created a PHD10TEST root folder on my drive D. Open PHD10 and imported the folder with 2 photos. Closed PHD10. Renamed that folder to PHD10TEST1. Open PHD10. Find works. Browse to d: PHD10TEST1 and checked apply to all images in the folder. All good now. Closed PHD10. Renamed the folder to 1PHD10TEST1. Open PHD10. Find and Browse to d:1PHD10TEST1. Again, Find works. Closed PHD10. Deleted the folder d:1PHD10TEST1. Open PHD10. Find window opens again. The same two photo thumbnails in all 3 tests above. There must be something specific to another users’ installation. I did not edit any photos. Each time the same two photo thumbnails appear. See the red highlighted box on the attached screenshot. My installation works properly even if you deleted the entire path. Maybe it is something set in the preferences like to a non existent or external drive but it seems to work properly with my internal drives. I have to agree with PIX on this one. Can't fix this as Find is not broken on my PHD10 yet. See the thumbnails and highlighted paths. Thanks for the update. I'm also having trouble duplicating my original findings, other than the problem always occurs whenever I reference that one particular folder (R:\Penny). I've tried putting a test image in C:\1\2\3\4\5 and changing various combinations of the folder names, but Find always brings up the expected window. I copied that folder structure to my R:\ drive, since sometimes programs expect things to always be on the C: drive, but everything works there too. It doesn't seem to be the folder name "Penny" since I have no problem with that folder name on my C: drive, so I'll keep checking. Quote Thanks for the update. I'm also having trouble duplicating my original findings, other than the problem always occurs whenever I reference that one particular folder (R:\Penny). OK. I've been swimming in circles for 2 hours. Somewhere along the line, I inadvertently corrected the issue and I was no longer able to get Find to fail. It worked every time, even on the image and folder that I had reliably been getting the failure on. Finally I've found another way to trigger the problem: Import an image from a USB stick, close PhD and remove the thumb drive, restart PhD. On my system Find does nothing every time. Interestingly, if you remove the drive when PhD is running and try to access the image, clicking Find brings up the appropriate box, so the issue seems to be related to a missing drive and path when PhD starts up. Imported a photo from a usb thumb drive. Closed PHD10. Open PHD10. All okay. Closed PHD10. Removed the usb drive. Open PHD10. Thumbnail and Photo appears as before and Find window opens. Click Find and nothing happens. Closed PHD10. Opened PHD10. Thumbnail and Photo appears as before and Find window opens. Click Find and nothing happens. Inserted the usb drive. After several seconds the Find window closes by itself. Photo can be edited. I have confirmed that if the drive is missing or disconnected then Find button on the window does not open the next window to browse. Inserting the usb drive and the problem goes away on its own after several seconds. In Myemerald’s screenshot. She highlighted and clicked the Bonaire2018 Tag which produced no thumbnails and images. If she clicked the Latest Imports instead then they may show up. Firstly, apologies for my absence from the discussion. Despite having posted earlier, I've received no notification that any further response had been posted. Glitch in the system. Your investigations have gone way deeper than mine, as I wasn't able to replicate the issue reported. I made screen captures of both the perpetual & 365 versions of PhD10, both of which functioned perfectly. I did not, at any time, consider renaming or removing a drive. For what it's worth, here's the capture of the perpetual version (the 365 is really just a repeat). Although you've both almost reached some sort of conclusion, based on your testing, I'll test further. I've just read all the new posts from optodata, tomasc, and PIX. My head is spinning. Quote I've just read all the new posts from optodata, tomasc, and PIX. My head is spinning. I'll try to read through, and understand, everything tomorrow. Please let me know if you want me to try anything from my end to test the theories. I think the two most relevant parts are the last paragraph in my last post, and the last line from tomasc's reply. Thank you, PIX, for pursuing this. Optodata should get the credit for pursuing this to the end. We all agree now that if the drive is missing like someone forgot to powerup their external drive with the original photos then Find will not continue. You still see the images and thumbnails as usual. This won’t work if you click Tags. The OP did not give details that the drive with the original photos is not powered up or connected. The problem would be easily solved if it was. The Op can then browse to the correct drive. Believe that she had many posts on PhotoDirector in the past. Hopefully this will help the next user with the same issue. EDIT: Hi Myemerald - optodata can’t let it rest. His persistence led to finding the cause of the issue and the solution. This helps us all to know this. Give him two thumbs up!! Thanks tomasc This was definitely a team effort, and I've filed a request with Tech Support and referenced this thread so they'll be able to see all the responses here.